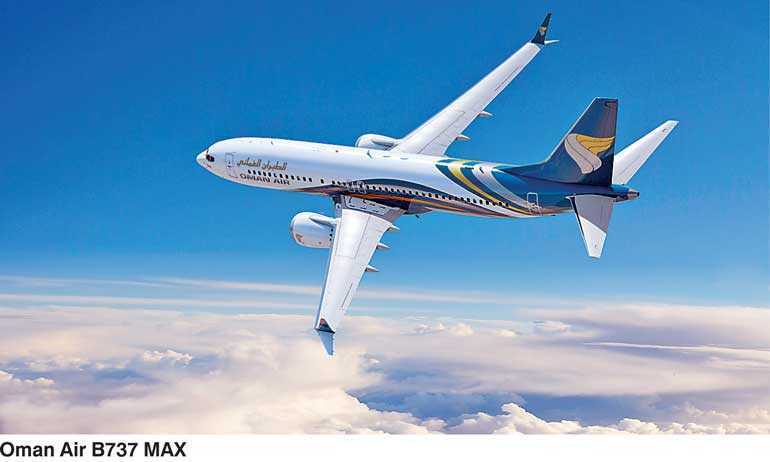 Oman Air, the national carrier of the Sultanate of Oman, is set to take delivery of the fourth of 30 Boeing 737 MAX 8s it has on order. By the end of 2018, Oman Air will have taken delivery of five new MAX aircraft and three 787-9s.The Boeing 737 MAX is at the forefront of aviation technology and amongst the most efficient planes in the sky today. Business Class passengers will enjoy the largest screens provided on a single aisle aircraft and Thales’s unique passenger interface will enable Business and Economy passengers to access an impressive list of entertainment and informative features with incredible viewing angles. Configured with 162 seats in a two-class configuration: 12 in business and 150 in economy with significant enhancements across both cabins, the MAX aircraft is an example of Oman Air’s commitment to continually upgrade its product offering to improve its customer satisfaction and enhance the overall guest experience. The Business Class seats are a 46 inch seat pitch, with a sliding recline feature, a 17 inch touch screen monitor and many other features. Economy seats offer a 30 inch seat pitch with a 5 inch recline, 10.2 inch touch screen monitor, a large foldable table and other features. Oman Air’s fleet consists of four Boeing 787-8, four 787-9 Dreamliners, six Airbus 330-300s, four Airbus 330-200s, five Boeing 737-900s, 21 Boeing 737-800s, four 737 MAXfour Embraer 175s. By 2022, Oman Air’s total fleet size is expected to be around 70.